Uhm, This is GiGi from Siddha Yoga ashram in Hawaii and as enlightened as I am, Andrea I cannot believe you posted another enlightened soup from me, no matter delicious it is. What is done is done, and you may keep it in this post this one time. I have to say... it seems quite standard and normal without the name "sour cereal" - but that seems to take it from normal, to super spooky! And that is crazy about the gun laws! I live in Australia, and... you would never see anything like that here. No one carries guns other than law enforcement! Thanks for the recipe, Andrea! The soup was pretty intriguing when you posted about it last time. I wasn't sure what to expect but anything with ginger, hot chiles, and dates sounds very good. Andrea, I've been meaning to wrap with collards for eons now; thanks for the nudge. As for cabbage, have you tried freezing & defrosting the head first? It's my grandmother's trick & it works wonders. The whole concealed carry thing is scary here. I feel like we're going backwards. Between that & Walker, Wisconsin has really gone downhill, IMO. 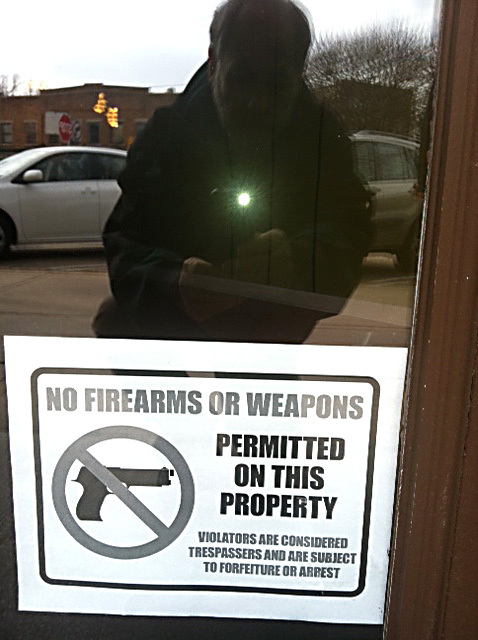 Seeing those signs on doors of businesses is so strange. The soup & rolls looks really good. I love the combo of ingredients in the soup. Thank you for your benevolence. The name seems strange to me, too, as the soup isn't sour or fermented. Australia 's got it right. I don't think people should carry weapons. According to Wikipedia, "while there is no federal law specifically addressing the issuance of concealed carry permits, 49 states have passed laws allowing citizens to carry certain concealed firearms in public, either without a permit or after obtaining a permit from local and/or law enforcement. Illinois is the only state without such a provision." Many years ago, I lived in Geelong for five months, and traveled throughout Victoria Province as well as to a few places in NSW. 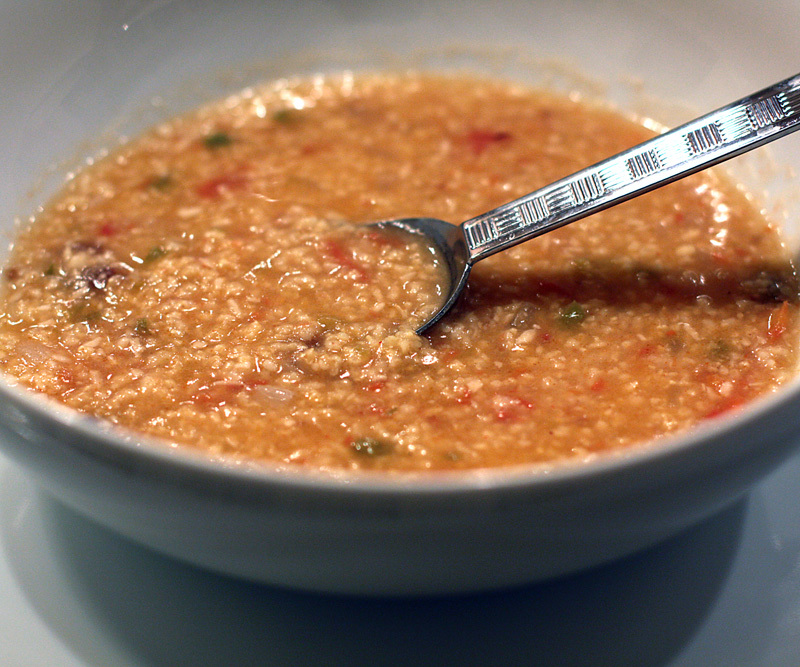 The soup is really, really good, though I plan to update the recipe, of course. I've never tried the freeze-defrost thing, just the burning fingers routine. I'll try looking for more info about that. However, the collard wraps worked great — just steamed them until flexible in my bamboo steamer, and trimmed the ribs so they rolled up easily. Have you signed a petition yet? RECALL! I really want to make this recipe soon! It's such a unique way to use millet, well I would never have thought of it anyway. 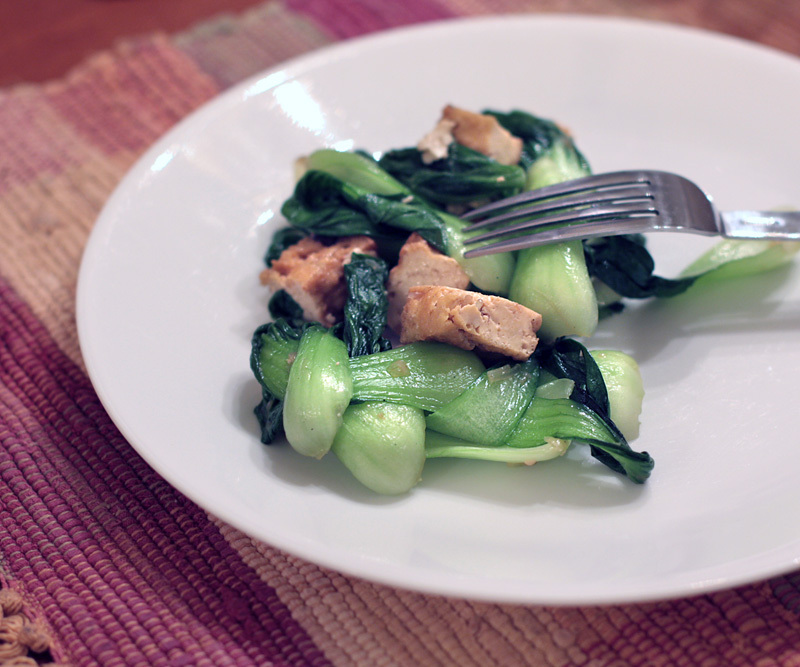 The bok choy looks yummy too; it sort of looks like you braided it. Wow, the wonders of living in a fear-based society. Charming. Are you still registered to vote in WI or will you be voting in WA now? Because it looks like ever since you moved, WI's politics have gone downhill! I'm sure WY allows guns everywhere. I'm surprised they don't require people to carry them. And they probably wouldn't let anyone post a sign like the one in the window of the Green Owl. (Since it would infringe people's right to be paranoid and violent, heaven forbid). I never would have thought of it either. (The other kind of weird thing I've made with millet is millet mashed potatoes.) As for weaving the bok choy — can't take credit for that, and didn't even notice it! The self-braiding bok choy was a great purchase from Costco. I'm happy to say no vote of mine went towards electing Scott Walker and his crew. It's been a sad two years for Wis. politics and the people who live in the state — especially the hard-working people who've seen their bargaining rights disappear. I hope the recall election is successful; I hear the petition signing is going well. Yeah, the concealed carry thing stinks. We don't have the signs on our school, thank goodness, because schools are exempt. But I see them everywhere and it's creepy. You'd be amazed at what you can get at Costco. After an initial rocky start, Costco and I are good friends. I didn't realize that 49 states have concealed carry. I think I'll get a sign for my house, just in case. Now what are you going to do with that 12 gauge shotgun I know you're fond of toting around? The soup - how very unique. I studied the recipe, and I think the flavors would definitely work...for me. Now, my family, er, ah, oh well. I'll make it on a night when we have lots of leftovers for them to choose from. I'll have to get much looser pants. The soup is so good, and you'd never guess it was made with millet. It's a little spicy, though you can control that. The soups sounds delicious. I can't wait to try it. 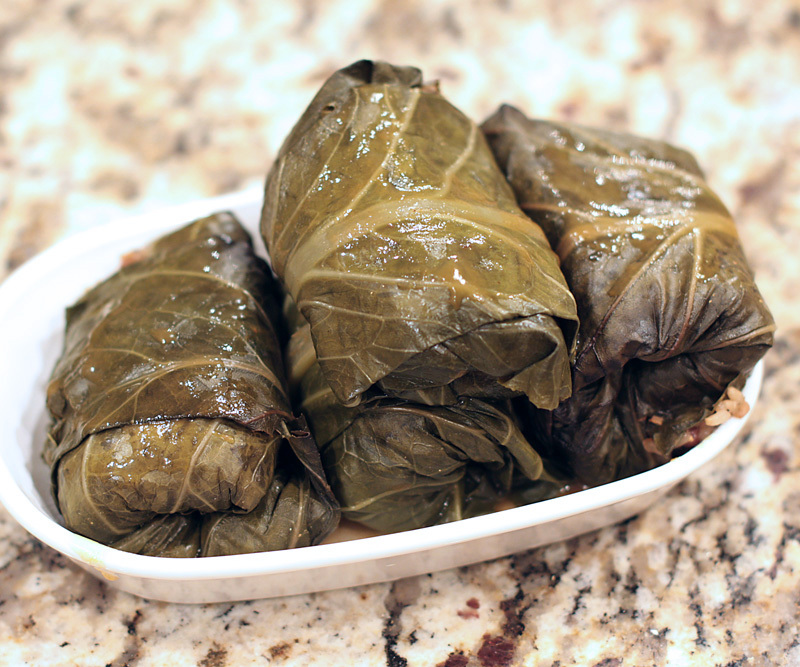 And, your stuffed collard leaves look so pretty. I think I may need to put those on my menu soon too. I hope you like the soup — I love it! I want to try making collard rolls with a traditional cabbage roll filling and cook them in sweet/sour tomato sauce — maybe in the slow cooker. Me, too. I don't understand the name at all. I don't think I've ever seen lotus leaf bundles! I grew up eating the "sour cereal" that was posted here, but my mother hasn't made it in years and your recipe has helped fill in the missing pieces. Thanks. The chilies we used were Anaheim chilies and 3T dried coconut flake instead of the oil. The cumin was whole and added with the masala. Add in 1 bunch fresh cilantro at the end and top with brewers yeast! sooo good! Thanks for the added information, Melinda. I'd never had this before but I thought it was really fantastic. The masala has 1/4 cup of dried coconut — I'm wondering if the additional coconut is also added.